Juneathon Day 14. A Reward! So after 2 weeks of Juneathon I reckon its time for a reward. CAKE!!!!!!! Keeping to the spirit of Juneathon, this cake is great for a pre-run breakfast, and also great for carb loading. The fruit is good for slow energy release, the soft brown sugar is better than white for the same reason. 1. Pop the dried fruit and tea in a large bowl, cover with a clean cloth and leave to soak overnight, until the fruit is plump and juicy- it won’t soak up all of the tea though! 2. The next day, preheat the oven to 175C/375F/Gas 3 and grease and line a large (2lb) loaf tin. 3. 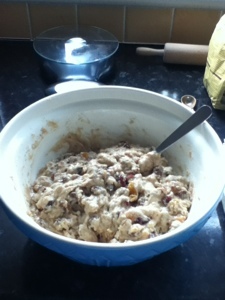 Add the flour, sugar, egg and spices to the bowl with the fruit and mix well. 4. Pop the mixture in the loaf tin and bake for 75 minutes or until a skewer inserted into the cake comes out clean. 5. Remove the cake from the tin, remove the greaseproof paper, and leave it to cool covered with a cloth (so the outside stays moist). 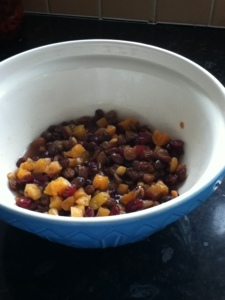 I found a lovely dried fruit mix at Sainsburys – as well as raisins, sultanas etc it has cranberries and apricots in – extra yummy. 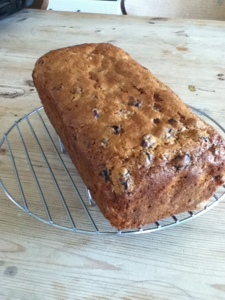 I can’t take credit for the original recipe, which came from Goldilocks Running blog.Thank you! Now before you all go off to make cake, I should report that I did actually run today as well. 4 miles in total, a mile warm up, 2 miles fast(er), and a mile cool down. Posted on 14/06/2013 14/06/2013 Categories Juneathon, RecipesLeave a comment on Juneathon Day 14. A Reward!